After Splendido closed, a place for a luxe brunch also disappeared. 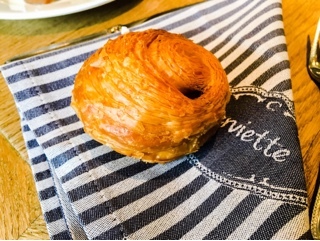 But, when a friend suggested visiting Colette Grand Café for a celebration, it was apparent that someone’s filling the void. 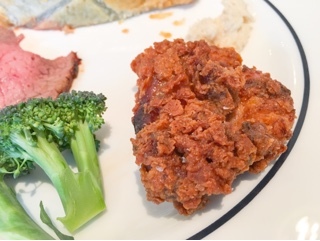 At $54 a person, the pricing certainly points to luxury; but being a buffet, I had doubts whether the food could be executed with precision. 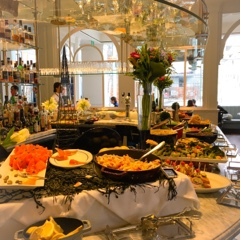 Colette’s buffet consists of two areas: cold options surrounding the bar and hot foods set up separately further into the dining room. 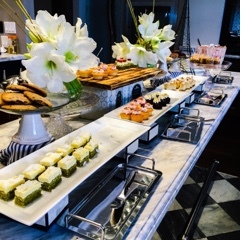 Along the bar, there’s a seafood station, salad bar, antipasto, charcuterie & cheeses and the dessert area. As a lover of the sea, the shrimp and crab claws peeked my interest; they were already peeled and prepped so eating was a breeze. The accompanying cocktail sauce had a strong horseradish bite and interestingly incorporated some herbs (mint perhaps)? The seafood salad of calamari, imitation crab and shrimp was also refreshing, but a tad sour. Within the chafing dishes were breakfast staples - eggs, bacon, sausage, pancakes and French toast, just a few of the options. When the fried chicken was being replenished, the smell made me take a piece. Thankfully, it tasted as great as it smelt: succulent, crispy and surrounded with a well-seasoned crust. You could make yourself a great chicken and waffles at the restaurant. 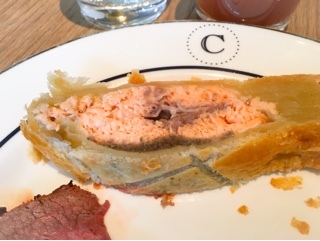 The carving station was serving a moist salmon wellington, which had nicely seasoned mushroom and spinach layers, but the pastry too thick and not cooked through so it was left as a clump rather than rising to flakiness. It was still delicious, if you just ate the inside. 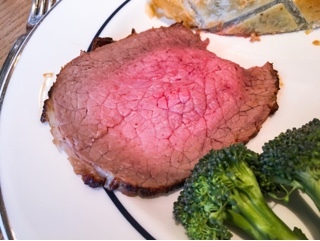 Luckily, the roast beef wasn’t overcooked, but needed a stronger rub given the meat wasn’t served with au jus (there was mustard and horseradish). 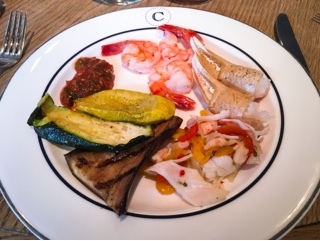 Being an upscale French restaurant, Colette’s hot buffet filled with American diner favourites was off-the-mark for me. Why make pancakes when there could have been crepes? Is chicken and waffles really the most appropriate, when mussels and frites more culturally correct? 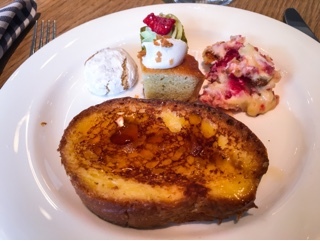 For a country that is known for their delicious desserts, this was the most disappointing course at brunch. 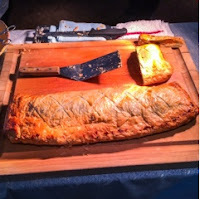 Although everything was beautifully presented, many simply lacked taste. Of the things I tried, the square of green tea cake was passable but the eggy French toast from the breakfast area was much better. There was a yoghurt parfait that could easily pass as dessert – the dairy thick and creamy, fruit compote sweet enough, and granola buttery and spiced like crumble. An honourable mention to the bread basket filled with crispy soft baguettes (went perfectly with the selection of soft cheese) and flakey chocolate croissants. Included with brunch are all non-alcoholic drinks including coffee, tea and juices; these could easily add $7 onto any meal. I rather enjoyed the strawberry and passion fruit juice, which seemed freshly made and free of added sugars. Overall, Colette is a great atmosphere, especially to celebrate an occasion (there were about five birthdays on our visit). A personalized card and cake lit with an impressive sparkler was a nice gesture. 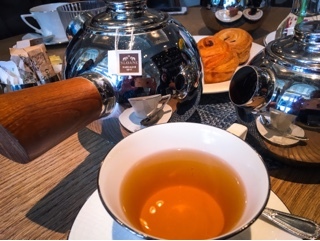 Despite having a constant stream of customers, we weren’t rushed and felt welcomed to sit and chat after the meal (the ideal time to enjoy their selection of Sloane herbal teas). Service is the one area I’m glad Colette deviates from French origins. Unlike the stereotypical French reputation, the restaurant’s servers were gracious, warm, and friendly.